Spring time means spring sports are back, including track and field. Some of the world’s most prominent runners are gearing up for some big events, but injuries within this sport can provide roadblocks for some athletes. “I just want to run some fast times and finish the season injury-free, so I can focus on these three major championships coming up,” said Usain Bolt, the Jamaican runner who is often referred to as “the world’s fastest man.” He plans to compete in the 2015 IAFF World Championships, the 2016 Olympics, and the 2017 IAAF World Championships. However, a foot injury proved to be a disappointing setback this year. 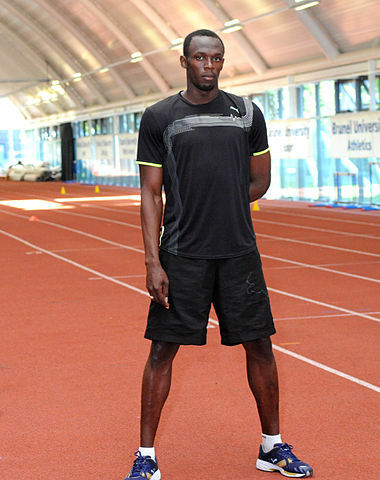 Usain Bolt is a six-time Olympic gold medalist for sprinting. No previously scheduled meets have been cancelled, although Usain Bolt will be starting the season later than usual in mid-June. Usually he runs the Diamond League meeting in early June. He was beaten by Justin Gatlin last year, and many fans were hoping to see the world champion compete in 2014. After a three-month hiatus, he is expected to run in Ostrava on June 17th, Paris on July 5th, and Malmo on August 5th. There is no word on what type of foot injury Bolt sustained, but we do know that he went to his preferred sports doctor in Munich, Germany, for two weeks of rehabilitation. Dr. Hans reportedly uses some controversial healing techniques — like injecting his patients with calf’s blood, honey, hyaluronic acid, and stem cells to allegedly stimulate rapid healing. A TENS unit can deliver low shockwaves that trigger the body’s healing mechanism. Here at The Center for Podiatric Care and Sports Medicine in New York, we are a little more conservative than Dr. Hans, but we do specialize in cutting-edge technology designed to get athletes back into shape and competition sooner. We don’t believe in the injection of bizarre cocktails into the body, but there are some injections and newer medical treatments that are scientifically-proven to benefit athletes. For instance, cortisone injections have long been used on arthritic joints and to ease the acute pain associated with plantar fasciitis. Platelet-rich plasma injections use the body’s own “spun” blood cells to stimulate natural healing. Shockwave therapy is another minimally-invasive treatment for foot pain that we offer. We understand how patients’ biomechanics work. Through our in-depth gait analysis program, we can identify where structural anomalies are present and help you take corrective action. Most patients benefit from simple solutions — like wearing a pair of custom orthotic inserts in their shoes. We can also counsel you on what type of shoe to purchase to achieve maximum efficiency. Aching feet are not normal, even if you are running on them all the time. Seek prompt attention before your condition worsens. What we find most appealing about Bolt’s story is that he opted to play it safe and seek medical care before it became a major career-ending issue. Far too often, people let things go, avoid treatment, return to activity too soon, and end up with a long road to recovery. Bolt understood that foot pain is not normal. – Micro-tears in ligaments, muscles, or tendons. Or it’s possible that a sore foot could just be from wearing improper footwear. At any rate, a sports medicine doctor will be able to diagnose the root cause of foot pain and get athletes back to running in no time. If you want to be a world-class athlete like Bolt, you may need to delay some of your goals and take care of that nagging foot soreness today. Book an appointment online.